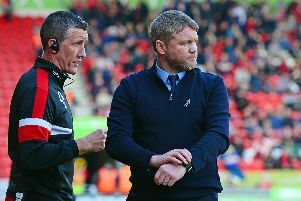 Doncaster Rovers boss Grant McCann has warned his players that anyone resting on their laurels will be out of the team like a shot. McCann admitted that he picked the wrong team after Saturday’s 2-1 reverse at Coventry City – a fourth defeat in six league games. Rovers still lie eighth in League One, just two points adrift of the play-off positions. But McCann says he will not be afraid to wield the axe if anyone is not pulling their weight. “I've got no time for inconsistency,” said McCann. “I've given people the benefit of the doubt, the ones that got us into this sort of position. Andy Butler and Niall Mason will return from one-game bans at Charlton Athletic this weekend. Paul Taylor is in contention for his first league start after again impressing as a second half substitute at the Ricoh Arena. McCann, meanwhile, has insisted that Mallik Wilks is in the right frame of mind to continue playing. The 19-year-old forward is facing the prospect of Crown Court trial after pleading not guilty to charges of violent disorder and assault occasioning actual bodily harm last week. “I'd rather not speak about Mallik to be honest with you. The club and Leeds have made a statement about it,” said McCann following Saturday’s defeat. “Mallik's fine. That's the reason we played him. Rovers’ under 18s face Rochdale in the first round of the FA Youth Cup at the Keepmoat Stadium tonight (7pm).